Kinshasa....A 45-member international Carter Center delegation led by former Prime Minister of Canada Joe Clark observed the Democratic Republic of the Congo's presidential runoff elections Oct. 29. Carter Center Peace Programs Associate Executive Director John Stremlau was co-leader of the delegation. The runoff election between President Joseph Kabila and Vice President Jean-Pierre Bemba is hoped to end years of conflict in the DRC. Results are not expected to be announced for about a week. Sunday's election concludes the country's first fully democratic polls since independence in 1960. News agencies reported that voting was mostly peaceful but a drunken soldier shot dead two election workers on Monday, sparking riots, and at least one person died in protests over alleged fraud in the northeast. The Carter Center delegation will hold an official press conference Wednesday, Nov. 1 at 3 p.m. local time, and will issue a preliminary post-election statement. The text of the statement will be posted in full on www.cartercenter.org. The Carter Center began long-term election observation in the Democratic Republic of the Congo in April following an invitation from the Independent Electoral Commission (CEI), and the welcome of all major political parties to observe the presidential and legislative elections. A 58-member international delegation was deployed to observe the country's July 30, 2006, presidential and legislative elections. Members of the observation delegation to the October 29 elections, representing 14 countries, were deployed to all 10 DRC provinces and Kinshasa. The Center's observers conducted pre-election assessment in their deployment areas and witnessed poll openings, voting, closing, and counting on election day. The Center will continue its assessment throughout the tabulation of and announcement of results. 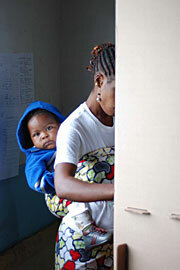 A mother votes in the Congo elections in the Ngaliema commune of Kinshasa. 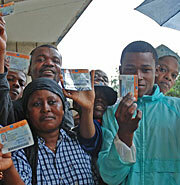 Voters proudly display their voter identifications cards at the Universite Simon Kimbangu polling station in Kinshasa, Congo. An electoral agent stands by a polling station in Limete commune to check voter identification cards and direct people to their polling stations. 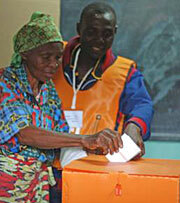 An elderly woman in the Ngaliema commune of Kinshasa casts her ballot with assistance from an electoral agent. 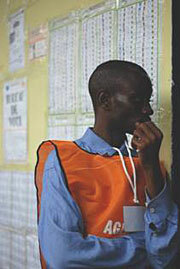 National observers monitor the runoff election October 30 in the Democratic Republic of the Congo. Carter Center observers Karin Ryan and Ed Mininger talk with an election official at a polling station in Ngaliema.